Rome is a fairly compact city which I prefer to traverse on foot. Given the traffic, those braver than I opt to drive a scooter in Rome. Sure there’s also the metro. All two lines that cross at exactly one point. (Yes, they are building a third line but here is more on the unicorn that is Metro C). But if you are visiting or trying to survive in Rome without a car you probably need to ride the bus. 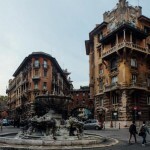 Buying a bus ticket in Rome is fairly easy but it is definitely NOT logical. (Hint: you cannot buy a ticket on the bus). Bus tickets currently cost €1.50 and are active for 100 minutes from validation. (Side note: please do validate your ticket once you get on the bus. There is a machine near each door. An unvalidated ticket is the same as having no ticket at all and could land you some serious fines). 1. 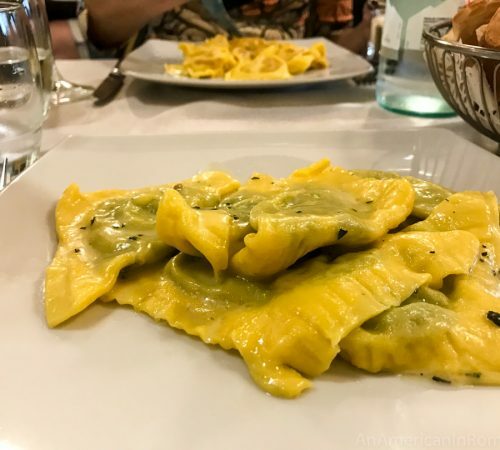 At a Tabbacchi: I love the multi-functions of tabbacheria in my life. They tend to be open long hours, quick and efficient. If you need a bus ticket, you can probably easily find a tabbacheria. Here you can buy a single ticket (or multiple single tickets to keep on hand). 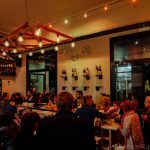 You can also reload your monthly pass, an abbonamento, at most Tabbacchi. 2. At an edicola: what tabbacheria are to cigarettes, edicola are to newspapers. In addition to printed press (and random toys for children) these stands also stock Rome bus tickets. They are found out and about around the city, and are usually open until about 9 pm. 3. At a metro station: the ticket used on the metro is the same used for buses. Metro stations have self-service machines where you can buy single ride tickets or opt for 24 hours, 3-day or 7-day passes. Tickets can only be used for one metro ride but once validated, they valid for 100 minutes. That means you can take a bus after your metro within that time period or take multiple buses with no need for a transfer ticket. Ok, well it is technically possible to buy tickets from **some** buses. Which buses? Impossible to predict, but some have machines that will give tickets if you have coins change. Tickets cost €1.50 and using a €2 coin will get you a ticket but no change. Do not bother asking the driver, he has none to sell. 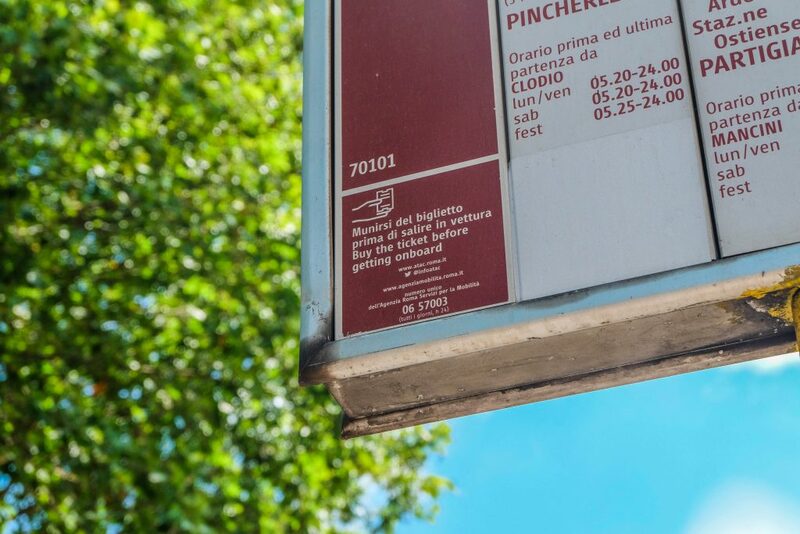 It is even written on the bus stop that you should purchase a ticket before boarding. 5. On an app: I use the app myCicero to buy tickets on my phone occasionally. You have to preload your account from either a credit card or PayPal, and then you can choose to buy and activate the ticket (or multiple tickets if you are in a group). I find that this works only sometimes – it is definitely an imperfect app and sometimes has blackout periods. However, if you are on the go and have access to data, it can be a convenient way to activate bus tickets without needing to have small change and find an open shop. 6. From Atac for a yearly pass: if you are living in Rome and planning on using the bus or metro, a yearly pass is your best bet. These passes require you to apply in person or by mail, but that small inconvenience comes with a pretty good deal – only €250 for 12 months, or about €20/month! 7. From Atac, Atac online or (most) tabbacheria for a monthly pass: If you are unwilling to commit to a year of buses, you can get a rechargeable plastic card and buy a monthly pass every month. €35 is all it takes to ride local buses, metros, and some regional trains for the calendar period. I love not having to remember to validate the paper tickets so this is my preferred option, though I should probably get a yearly pass to save even more. 8. 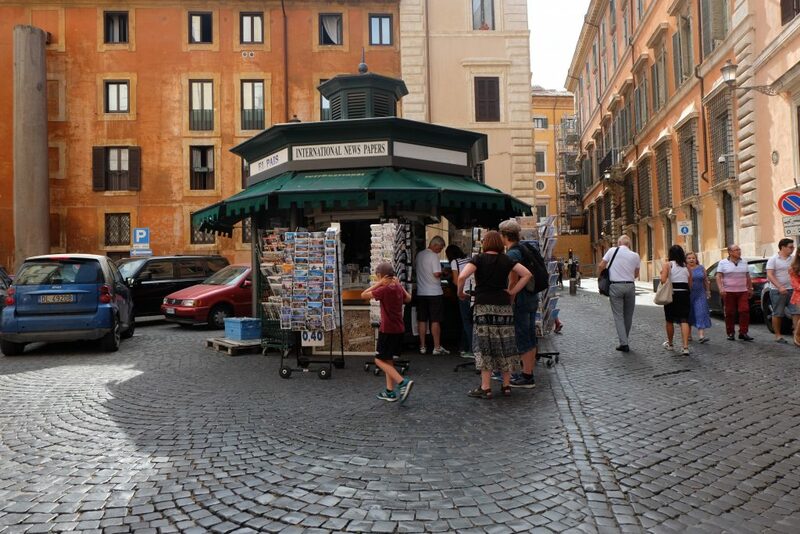 Roma Pass: If you are in Rome for a short period of time and want to see several sites/museums, then you may want to consider buying a Roma Pass. 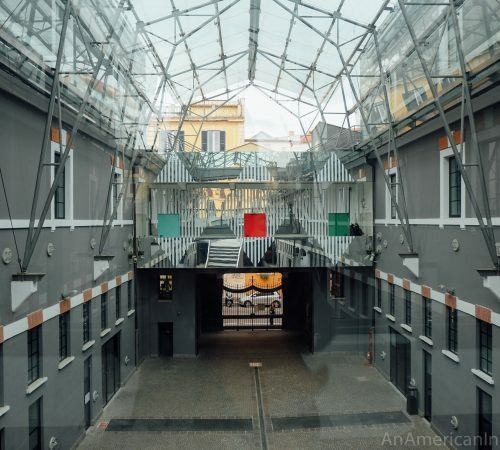 Roma Pass includes free public transportation in addition to museums discounts. As long as your pass is valid, unlimited free bus rides are yours to claim. (Note that if you buy the pass online, you still need to find a Tourist Information Point to claim the physical Roma Pass. The link to Tiqets is included for convenience but is an affiliate link meaning we may earn a small commission if you choose to buy it but you are under no obligation to do so). There you have it. 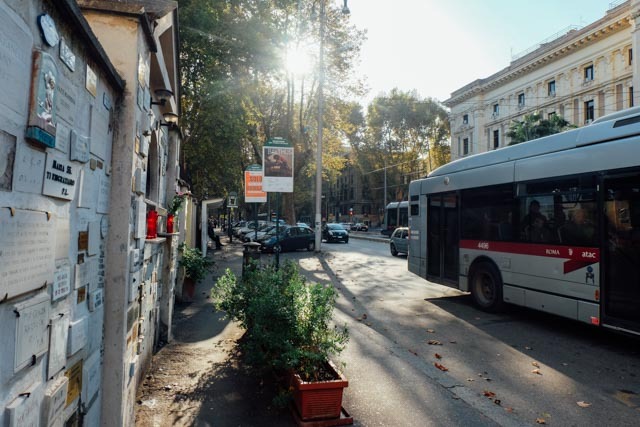 8 not-so-simple ways to buy a bus ticket in Rome. Do you have any other tips? *This assumes the bus will come. I make no excuses for the sad state of Rome’s bus timetable. Seriously. I often find myself walking. When possible, try to take the tram instead of the bus in Rome because those at least seem to appear more frequently. Hi Greg, I’m planning my fifth trip to Rome and I recommend the TIM store in the Roma Termini train station (do not use the TIM desk at Fiumicino airport, as they ripped me off); it’s upstairs on a mezzanine near some quick food options. I bought their cheapest call/text flip-phone and I get a new SIM card each visit. I think the phone was 40 euros in 2014 and included a certain number of minutes/texts, and new SIM card costs vary depending on how many minutes/texts you’d like. The store will help you insert/activate it, and you should be ready to make a call about 30 minutes later. Hi Cathy and Greg! Agree that the airport is not the place to buy it. Termini is a good option because there is TIM, Vodafone and Tre. I personally use Vodaphone, so I can say that a SIM is 10 euros, and then you can sign up for a simple plan with data, minutes and text. I pay about 20 euro a month for 4 GB of data, 1000 minutes and 1000 texts. It also works in every EU country without roaming. The plan is based on you buying credit every month, so if you don’t buy credit after you leave, you won’t be charged. I love your blog…. lots of great info for my trip coming up at the end of October. I’ll be there for a whole week (4th time for me, first time for my young adult daughter). Is a metro station the only way to get a 7 day pass? We will walk lots but want the option of busses for when we are tired ?. Staying in the ghetto area, so would like to get the 7 day pass close by if possible? Your timing of information is perfect for our group trip next week. Another great post I’ll share with my friends. I’m so glad! Have a great trip! My experience is that the edicole to do not have them. Since I’ve lived here, I’ve asked 2 or 3 and they always point me to nearby Tabbacchi or bar. It’s worth noting that many bars will also have the telltale tabbachhi “T” outside their door which generally means they have bus passes. Good tip! I usually manage to buy them from edicole in the center but this might depend on neighborhood. This sounds intimidating. However, I think with your guidance, we should be able to get from point A to B with no problem. Thanks for the assistance. Thank you for your post. We are arriving at FCO and will take the Leonardo train into Rome. From there we’ll need to buy metro tickets to get to the hotel. 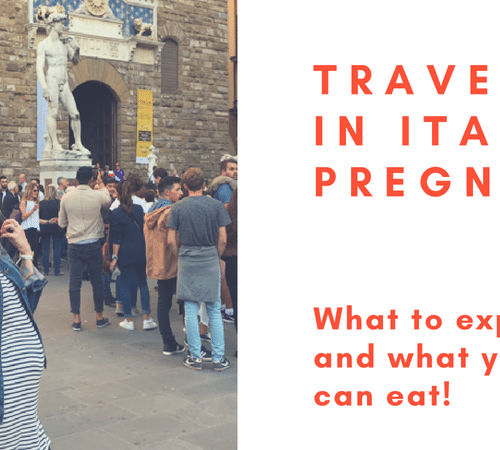 Having just landed in Italy, how do I obtain euros to pay for my tickets? From what I can find, you they cannot be purchased with credit cards or USD. Hi Shelly! I would suggest using the ATM at FCO. There are a few when you come out of baggage claim, and two at the train station. Do the monthly and yearly bus passes also work on the metro? And the Roma Pass? Can I purchase metro cards with a credit card at a tabbacheria? We are traveling with a group of about 12.. Also do you have to have each persons id for the metro cards or do they sign the card to use them? As far as I know, you cannot pay with a credit card. You MIGHT be able to do so at an ATAC ticket booth but I only know of one in Termini and one in Piramide. You do not need to give anyone’s name unless you are registering for the monthly pass. Literally everyone does it once and a while – but don’t get caught! The fine is steep! Hi! I think that some will be available because they know that the mass will be letting out. You can also download Uber for a very last ditch option. They will be available but probably more expensive than usual.